In Helix, think of template inheritance as interfaces on an item which exposes a certain set of data to the business logic. This makes it possible for a multiple modules and business logic to share items and content, but simple look at the interface of the item which they understand. The architecture does not have the concept of a single common base template across all templates – which is a practice that is commonly discouraged as it will often lead to bloated items with unnecessary fields. Any business logic or views which uses content on an item should therefore only reference the base template of the item – by using a is operator approach (for example by using the Item.Template.InheritsFrom) – which allows for much less coupled feature modules and a freer content architecture. This figure shows how the architecture allows business and presentation logic, i.e. 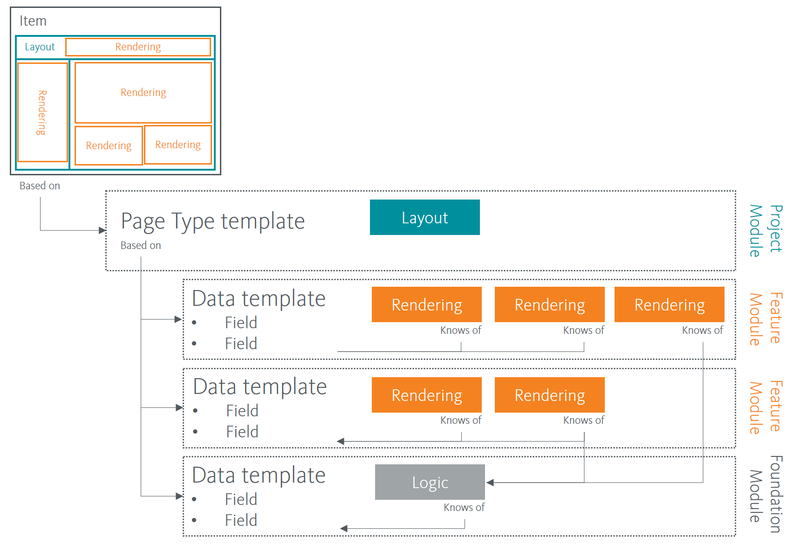 renderings, and other logic to recognize the templates and fields they require while at the same time allowing pages and page types to be designed with the specific presentation and organisational governance model in mind. In other words, renderings and business logic can be written with sole focus on the domain of the specific feature and oblivious to the other features or logic in the implementation.